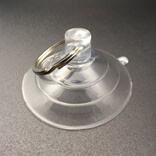 Big suction cups with ring. 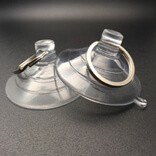 Big suction cups with ring. 60mm diameter. The suction cups are the most widely used products all over the country. There are many uses of suction cups. But while buying the cups, we should know how to differentiate the models as per the usage. The suction cups 60MR is one of the most widely used suction cup. Only high quality products are selling in the shops. 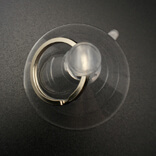 Therefore, a user will get durable and long-lasting usage with this suction cup. The diameter of the suction cups is around 60mm. The suction cups are equipped with the PVC solution. 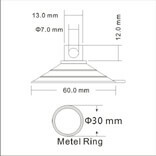 The ring is a metal type material. The hooks are enclosed with the suction cups. It is easy to adapt to people. The suction cups 60MR will be used for many purposes. The suction cups are reliable to use anywhere in the mobile phones. Most commonly it is used to hold the display screen of the iPhone. It is the main part that always gets damaged. This suction cups will never allow any damages to the iPhone. The suction wall hooks are generally used for fitting in the wall areas. Many rooms can also be fitted with the suction cups. As per the room, the buyers can buy the suction cups. For an instance, if you need it for bathroom, you can prefer buying the bathroom suction hooks. This will be most useful to adapt inside the bathroom areas.